Hi guys, at present time billion of users must have to use latest technology smartphone. These smartphones are developed by different mobile manufacturing companies which comes with latest features. Today we discuss an important article how to factory reset Android phone. Before know the process of how to factory reset Android, first you have to know what is the meaning of Factory Reset Android. Factory reset Android is a features which is found on all those mobile devices which runs on the Android operating system. With the help of Android factory reset feature you will remove all the device settings, data, different apps. After factory reset it restore you android phone or return the device in it’s original manufacturing condition when it is shipped from the company. Android factory reset provide the facility to wipe your phone from from the settings option. After the factory reset Android process your device will be converted in fresh condition. This feature remove all installed third-party apps, messages, images, videos and other things from your device. But i recommend you before doing this process take complete backup of your Android phone. 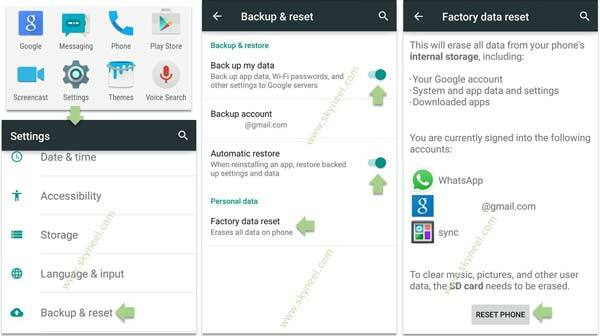 If you have backup then you will be able to easily restore your old data in your Android phone. Always take backup of your Android phone on more than one location. Step 1: First you must turn on your Android phone and tap on the “Setting” option. In the “Setting” box tap on the “Backup and reset” option which is placed in “System settings”. Step 2: Turn on “Backup my data” and “Automatic restore” option, then tap on the “Factory data reset” option. Step 3: Tap on the “Reset Phone” option. This will remove all data from your phone’s internal storage including all installed apps, Google account, system settings. It also clear all images, messages, audio, videos (If they stored in your internal phone memory) from your Android phone. Step 4: Finally, after complete the process of factory reset of Android phone, tap on the “Reboot” your Android phone. Most of the person Android phone will be locked due to forgot his pin password or pattern. In that situation you will not be able to show home screen. 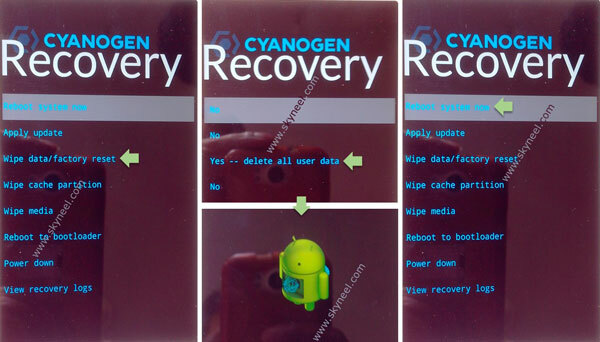 Then you must have to use factory reset Android by recovery mode (hard reset) option. This process is more complicated than first process. So, have patience, and follow all steps carefully. Step 1: Turn Off your Android phone, Then press and hold Volume up and down key with Power button at the same time until the device turn on. Step 2: Now you will get different options on the screen. Lots of Android device has touch recovery, So use touch screen. If your Android device touch not work in recovery mode then pressing Volume Down button to move between the given options. And Press “Power” button to confirm the selected option. Step 3: When you will see an image on your Android phone press and hold down power button as well as press and release the VOlume Up button. Step 4: Now, highlight the Factory Reset option by pressing Volume Down button. Press Power button to confirm the selection. Step 5: Highlight the “Delete All User Data” option by pressing the Volume Down button. Press Power button to confirm the selection. Step 6: Wait for some time after the process completed, choose Reboot to restart your Android device. I hope this article is helpful for all those guys who want to know how to factory reset Android phone. After reading this article you will be able to easily factory reset Android phone. Read carefully all these steps and share your knowledge with others. Thanks to all.